It is not our intention to advertise our activities with self-praise and raise expectations, which we cannot fulfil. We see it as our task to conserve teeth, copy nature as well as possible and to create using all the experience and scientific background available to us. However, this is only possible with the interdisciplinary cooperation of the respective partners, dentists, patients and laboratory community. 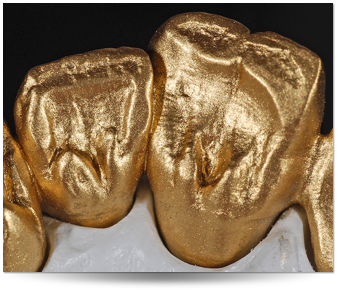 The wish of our dentists, to create high-quality restorations is our motivation and our passion. It is self-evident that this is only possible in harmony and the mutual understanding of all parties. Our motto is therefore: "We do not produce crowns, we produce teeth."